Acquired this last week. $700. Needs work. Bought it to tinker on. 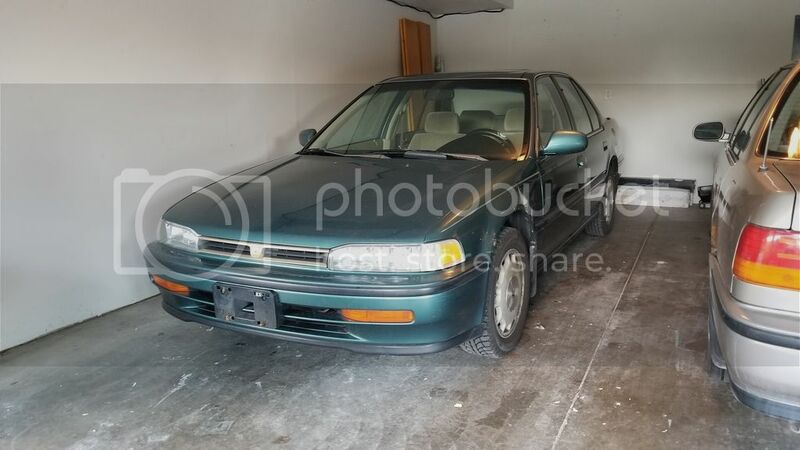 231k, sedan. Automatic. Arcadia green. It has a "custom" head liner. Leather door panels. It's a J vin not that it matters. I'll put it back to stock and do all the maintenance on it before anything. Only modifications are the headliner. Which is just fabric over the factory headliner. Has a dented front driver side fender as can be seen. It's repairable. Other than that it has very minimal rust. Which is surprising. Almost no rust in fact. Did it live up north its whole life? I only know about the last 3 years of it's life. Which it sat most of. Previous owner bought it in 2015. It pretty much sat since then. Or so I'm told. Guy I bought it from was nice. Went to Cedar Rapids Iowa to pick it up. So about a 30 minute drive. Needs brake work bad. Congrats on the new Cb7, it is almost a twin to mine except it is an EX. Thanks! I like the color. One of my favorites. I was looking for an Arcadia green fender on eBay. 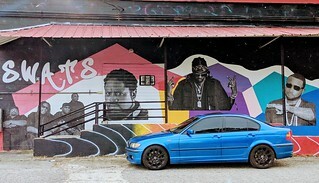 Apparently fenders for these cars are a $300+ item now dents included. Your better off buying the fender on Craigslist for $300 as they come with a free car at that price. Im thinking my dented up fender must be worth at least $100... I'll round up some random cb7 junk I have laying around and throw it on eBay. I'll probably retire next week. Seriously though, I'm getting some parts purchased. I want to get the a/c working on this as well. More to come. It is one of my favorite colors as well. I got lucky with my ac, all I did was check to see if it would hold vacuum for 30 minutes, charge it with r-12 and it's been good for years. Finally did something on this. Pulled the front wheels off to identify the vibration. Which is the passenger side CV shaft. And to see if it has Akebono or Nissin calipers. Next up, order outer tie rod ends, brake pads and brake hardware. It's always fun starting on a fresh canvas. She looks pretty good for a quarter million miles! I figured out what I want to do with this car. It's easy to pour money into something to make it nice and reliable. I've done that time after time. This time I want to see how little I can spend to make it nice and reliable. Knowing the manufacturers that are of quality is crucial as is finding parts on sale. This takes time and a close eye on websites like RockAuto, local classifieds and of course the classified section on here. This makes it fun! The end result is I want to see how nice I can make this car for how little. I will not short change reliability or durability. It has to be quality and a job well done. Just on the cheap. Cheap as possible. Something else to consider. On RockAuto I try to get parts from no more than two warehouses. That way I only have to pay 2 shipping fees. So sometimes when something is on sale it's not cost effective to purchase being as I'd have to pay shipping from a warehouse just for that part. It's optimal to purchase parts from one warehouse although that's difficult. So what parts are at which warehouse comes into play as well when penny pinching. Also, I'm not doing this because I'm in a bad place financially. I still have my Corvette, my Talon and my big block 4x4 Ford. Although it does help me save money to put into those other vehicles by "cheaping out" on this Honda that's not the purpose. The point behind it is having fun, keeping track of every penny spent and seeing where we are with it in a year or two years. I've never done this so it should be fun. First things first the car has a front crank seal, cam seal or balance shaft seal failure. I'm doing the timing belt and water pump replacement. To avoid incurring additional costs I've chosen to leave the balance shaft belt off as well as the tensioner and spring. I'm going to locate and install the balance shaft seal retainer if it has one. Also I will replace the balance shaft seal. 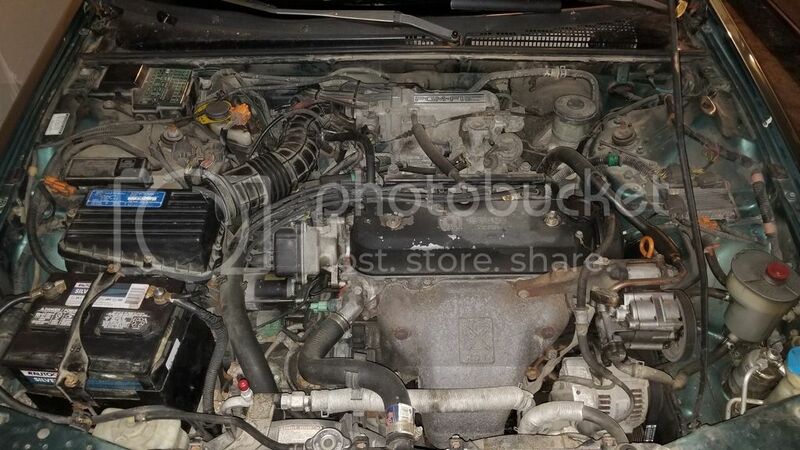 I purchased a Bando timing belt, Cloyes timing belt tensioner and a GMB water pump. Bando makes great belts. We all know that. Cloyes is huge in the domestic automotive industry. They are trusted and perceived as a quality manufacturer in the domestic automotive industry as well. 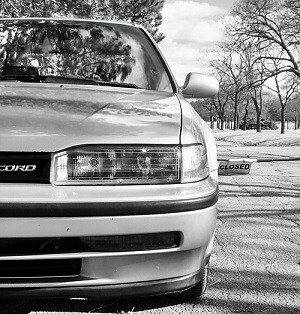 It's not a brand well known with imports however I chose this part because of it's name with domestics. GMB I was once told by someone on here that they supply some auto manufacturer with their pumps. Chevy, Toyoya, Nissan or something along those lines. So it's of OE quality to at least one auto manufacturer. So that's why I chose GMB. National for the front main seal. Another manufacturer well known in the domestic automotive industry. SKF for the balance shaft. Not so crucial being as I'm not installs balance shaft belt. However SKF is a good quality manufacturer. I think I have a Fel-Pro cam seal somewhere. If not I'll find one cheap. I may have an O'Reilly gift card with a few bucks on it that I'll use to purchase one. Eventhough I strongly dislike O'Reilly's with a passion. 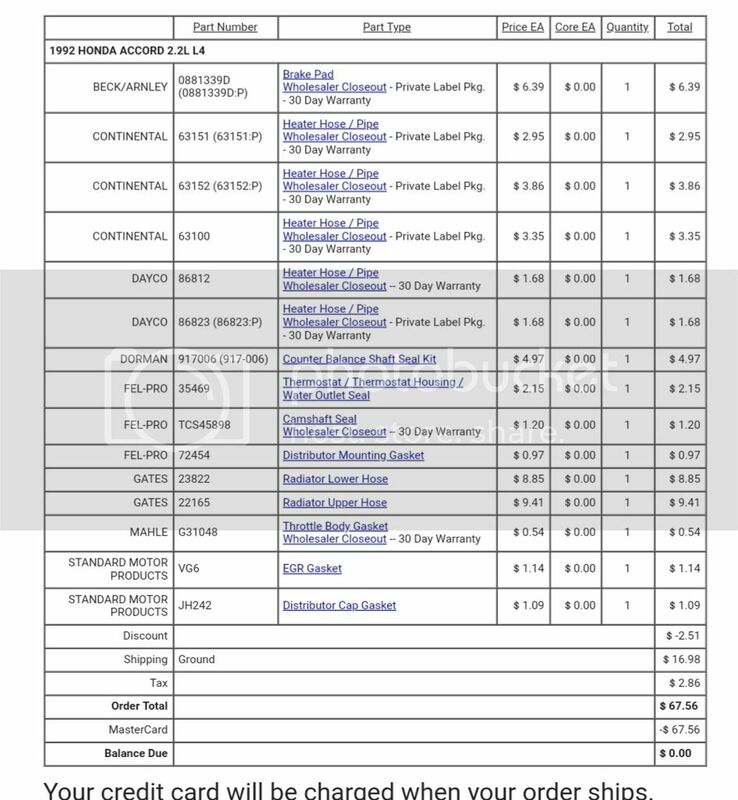 This is the parts list from RockAuto. There are other parts listed. They speak for themselves. Replaced the valve cover gaskets and air filter this afternoon. And some more parts arrived. I had a set of APWI CV shafts for an automatic new in the box sitting in my garage. So I decided to start installing them in this car today. These were for the 93 that I recently relocated back to Missouri. I started on the driver side. The same combination of tools I've been using for years to make removing the knuckles as easy as possible. The majority of bolts were somewhat difficult to remove so before reassembling I anti-siezed the crap out of everything. The brakes were really bad as can be seen. I found out the caliper is bad also. The boot was literally sitting around the piston loose. I'm not taking any chances so I have to locate and order new calipers for the front. With the new CV shaft installed. Awaiting new calipers. Total added cost today I'm calling zero as I had the parts for over a year. Total hours 11:30am to 2:30pm. 3 hours. Current grand total hours 4 hours. I keep forgetting how easy and cheap maintenance on these things are! The first time you break all the nuts and bolts loose is the hardest. After that first go around and the grease or anti-sieze it's not to bad. 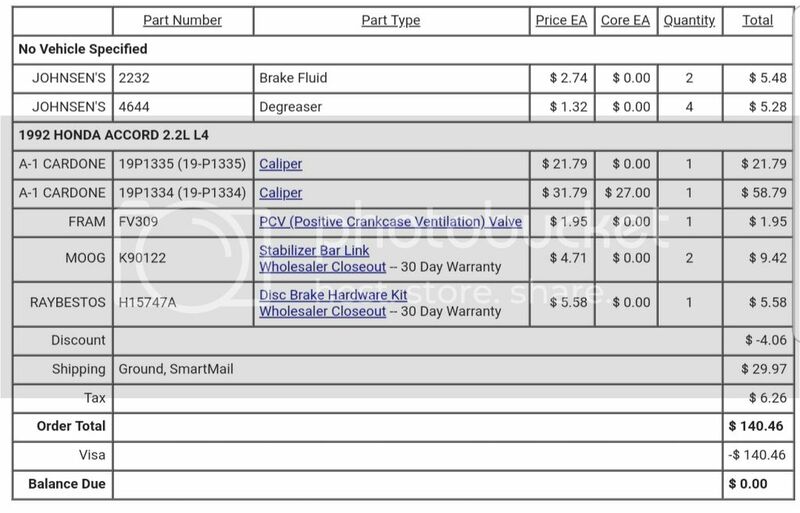 I need an egr valve kind of an expensive part that I don't fully understand why. But yeah, most things are really cheap. Found a block heater that I'm going to throw at it. Bought it last year as well. Brand new in package. Last edited by H311RA151N; 10-21-2018 at 09:33 PM. Picked up two quarts of dot 3 brake fluid since I'm replacing the front calipers. $5.48. 4 16oz foam engine degreaser aerosol cans for the engine compartment. $5.28. A1 Cardone brake calipers with rust prevention treatment. $53.58. Sway bar end links, Moog, got these on sale! Both sides. $9.42. $113.46 with core for one brake caliper returned. This should conclude all suspension, brake and related work this car will need in the near future. After this I'll dive into the engine bay and take care of everything there. Then following that cosmetics. Worked on it a little more tonight. Got the passenger side broke down. Everything is broke loose. Ready to be taken out and the CV shaft replaced. 4 cans of foam engine degreaser, 2 quarts of brake fluid and a caliper arrived. The caliper came with the rail. I thought it did but I'm super glad to see it for sure. It's coated just like it said on Rockauto. Pretty neat. Ready to go on the brakes. Will have everything installed on Sunday. 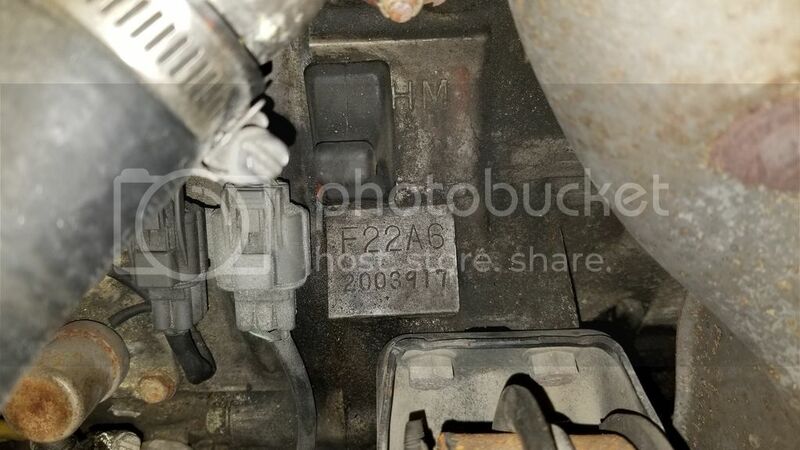 When I bought this car the previous owner informed me that it has a small coolant leak somewhere. I can see that it has a couple hoses replaced in the engine compartment however they used non-molded hose. So I decided I need to replace as many hoses as I could as try to stay with molded hoses as much as possible. Turns out RockAuto has a lot of molded hoses in sale right now. I also noticed the water neck off the front of the block that attaches to the upper radiator hose has red rtv all over the mating surface. So I got a seal to address that. The PO also told me that it needs a new egr valve which is why the check engine light comes on after driving for a while. So I'm going to take it off and see if I can clean it. Got a gasket for that. The distributor leaks a bit. Got a seal for that. Rear brake pads were on sale. Been waiting for that to happen. Got those. Got the counter balance shaft seal retainer kit. It was shipping from the same warehouse as the other stuff. Also picked up Gates upper and lower radiator hoses for the same reason. Going to clean the throttle body as well. 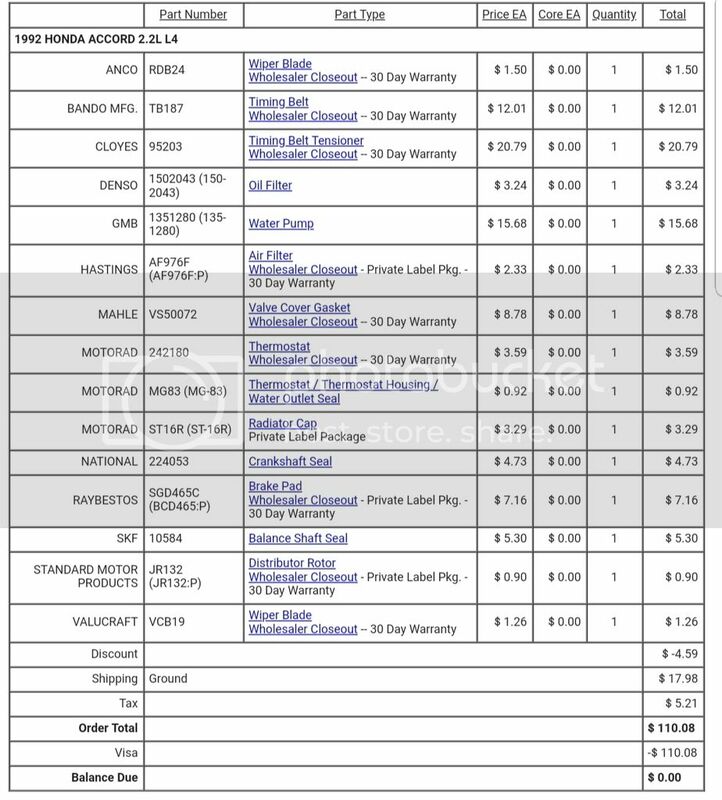 Picked up everything for $67.56 shipped.